Queens is the only borough in NYC that has dashes in it’s addresses. No matter where you go in Queens, you’ll notice that the addresses have dashes in them. This was really weird for me to get used to coming from Texas, but now it makes total sense and I’m totally used to it. Back in the day, Queens consisted of different villages and many of these villages had their own street names and numbers. Eventually it became overwhelming because there were a lot of repeating street names and numbers, this made things very confusing. So, in the early 1900’s a renaming and renumbering project emerged in order to fix the problem. You can still find some old street names around the borough even though they aren’t official anymore. 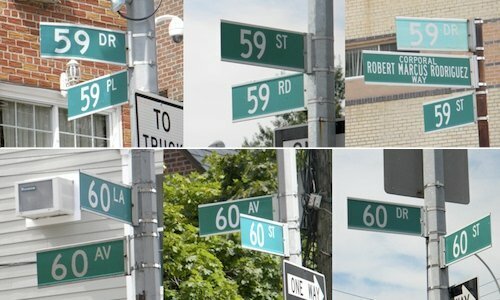 The project started out by removing all alphabetic street names and replacing them with street numbers. Street numbers (i.e. 47th St) were given out starting from 1 to X and ended either in Street, Place, or Lane. Approximately 80% of Queens has an underlying grid. “Streets” typically run North-to-South (think Whitestone to the Rockaways) and “Avenues” typically run West-to-East (think Long Island City to Queens Village). If additional streets were added after the original grid system was put in place, those were called “Place” and “Lane”, in that order. On the other hand, if additional avenues were added after the initial grid was laid out, those were called “Road”, “Drive”, and “Terrace”, in that order. Streets that were curved, or askew from the Queens street grid were called “Crescent”, “Court”, or “Terrace”. And all major thoroughfares that cross through several streets and avenues were called Boulevards (i.e. Northern Blvd, Queens Blvd, etc). The numbering of streets begins on the north western edge of the borough and they increase as you move east. As for the addresses, basic thing to know about the format of Queens addresses is the fact that they consist of three domains: two numbers, a hyphen, followed by the street name in which the building/house is located. Numeric field indicating the lower numbered street. Hyphen which is assumed to be in any Queens address. Numeric field indicating the house number. Obviously there are exceptions to the rule, however, if you understand this basic grid system, you should be able to get around Queens with no problem. If you have any questions about reading addresses in Queens New York, feel free to contact us anytime. 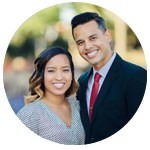 Site and Blog courtesy of George & Abigail Herrera with the Queens Home Team at Keller Williams Realty Landmark II.